Ron Botchan is a veteran 18-year NFL field official, having been a National Football League umpire since 1980. 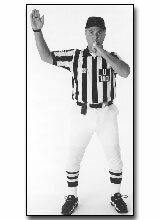 He has officiated Super Bowls #20, #27, #29, #32, and was an alternate for Super Bowl #26. The Belmont High School football and baseball star was a collegiate All-Conference baseball player and All-Conference and Little All-America linebacker at Occidental College. He officiated in the Pac 10 from 1976 to 1979. Botchan was drafted by the Baltimore Colts in 1957, but the U.S. Marines got first crack at his talents. Linebacking for the Corps’ Quantico and Camp Lejune teams, he was selected to the All-Marine and All-Service teams. In 1960-61, Ron was a linebacker for the San Diego Chargers, and was traded to the Houston Oilers the following season. In 1962, Ron became Head Football and Baseball Coach at North Hollywood High, before moving to Los Angeles City College 1966-71.